The invention relates to a washing active preparation containing a water-soluble or water-dispersible block copolymer which can be produced by controlled radical polymerisation, to a method for producing a washing active preparation of this type and to the use of water-soluble or water-dispersible block copolymers produced by controlled radical polymerisation for producing washing active preparations. The present invention relates to washing-active substances which have a content of water soluble block copolymers. Furthermore, the present invention relates to a process for the preparation of such washing-active substances and the use of specific block copolymers in detergent substances. Wash-active preparations are normally used for cleaning soiled fabrics, especially of contaminated clothing. The problem may, however, this effect that textiles of any kind, but especially those fabrics such as are used for making clothing, usually include a plurality of different tissues, which was also provided by various dyeing processes with different colors. The cleaning of fabrics using detergent substances should expediently remove contaminants from the textiles, but without changing the original appearance of the textiles significantly in terms of color and texture. While this task for monochrome textiles that are made, ideally, from just one material, is relatively easy to solve, arise with regard to the cleaning multicolored textiles or a mixture of fabrics of different colors, problems. Particularly problematic cleaning of textiles or textile mixtures here is to look at the bright colors and dark colors, such as white and have blue or white and black. Here, a color transition from dark textiles or textile components on the lighter is in the use of conventional washing-active substances often held so that a front of the washing process for example, white fabric piece can have a darker color after washing. However, such color transitions are unpopular among users of washing-active substances since the appearance of the textiles is adversely affected normally. To solve this problem a variety of attempted solutions have been proposed in the past. Thus, DE-A 2,232,353 respect example, describes a laundry detergent and cleaning agent mixture with improved dye transfer inhibiting effect. For the inhibition of the color transition is proposed herein to add a proportion of a water-soluble polymer component based on Polyvmylpyrrolidon a washing and cleaning agent mixture. a copolymer of Polyvmylpyrrolidon is described, for example with acrylonitrile or maleic anhydride to be advantageous. However, the copolymers mentioned have no block structure. The DE-A 28 14 287 also describes a detergent containing discoloration-inhibiting additives. In order to prevent occurring during the washing process discoloration is proposed a washing and cleaning agent to add a water-soluble or dispersible homopolymer or copolymer of N-vinylimidazole. However, the polymers described also have no block structure. Therefore, the present invention has the object to provide detergent formulations which largely prevent dye transfer during the washing process. which the object underlying the invention by means of a washing formulation, as described in the text below is solved. The term "block copolymer", a polymer is understood in the context of the present invention, which has at least two marked by a different monomer polymer blocks. Under a "different monomer" which is understood as meaning in the context of the present invention is that at least two regions of the block copolymer, a different having monomer composition. It is possible within the scope of the present invention that the transition between two blocks is continuous, that is, that there is a zone between two blocks, which has a random or regular sequence of the monomers constituting the blocks. However, it is also contemplated within the present invention that the transition between two blocks is substantially discontinuous. By "essentially discontinuous transition" is a transition zone understood which has a significantly smaller length than at least one of the separated by the transition zone blocks. It is possible that one block is based only on one type of monomer. However, it is also provided that a block of two or more monomers is constructed. In a preferred Ausfül of the present invention approximate shape is the chain length of such a transition zone is less than 1/10, preferably less than 1/20 of the block length of at least one of the separated by the transition zone blocks. Under a "different monomer" of the finding is within the scope of the present invention further understood that the constituting the respective block monomers are different in at least one feature, for example in their connection with each other, in their conformation or constitution. If, as already described above, a block is constructed in more than one type of monomer, various blocks of the block copolymers may differ, for example, also by different concentrations of each one block constituent monomers in the present context. Preferably block copolymers are used in the context of the present invention have at least two blocks whose monomer is different by at least the constitution of the monomers. b) 50 to 99.99 wt .-% of an anionic, cationic, zwitterionic or non-ionic surfactant having a molecular weight of less than 1,000. Preferably, the radical of formula (III) at least one compound of formula (I) derives ,. -OSiR 5 R ö R 7 or -SiR 5 R ö is R, wherein R and Rio are each independently defined as Ri to i, or two of the radicals Ri to j a C 4 - to C 7 ring in turn may be substituted or unsubstituted and optionally containing one or more hetero atoms may form, with the proviso that at least two of R to t j is a radical stabilizing and / or bulky group, as defined above, are. As part of the preparation of the copolymer used in this invention all free radical reaction, monomers as a monomer (a) can be used. Of course, mixtures of different monomers in the present invention as monomer (a) can be used. In addition, blank according to the above method, mixtures of at least one hydrophilic monomer and at least one hydrophobic monomer to polymerize. Diallyldimemylammoniumchlorid, dimethylaminoethyl acrylate methyl chloride, Dimethylaminoethylaminopropylmethacrylamid methosulfate, Vinylpyridiniumsalze or 1-vinylimidazolium; Monomers in which the amino groups and / or ammonium groups are liberated only after the polymerization and subsequent hydrolysis, for example vinylformamide or Ν- Ν-vinylacetamide, and mixtures of two or more of the abovementioned monomers. Preferably used as a first monomer (a) styrenes, (meth) acrylates or the free acid, dienes or Ν-vinyl compounds, preferably the representatives of this group which are already mentioned above, or mixtures of two or more thereof, optionally with at least a further free-radically homo- or copolymerizable monomer (a), use. used to access the radical of the formula (III). Again, all compounds of the above formulas are in principle erfϊndungsgemäß used as long as they meet the above and the given definition in the claims. It is particularly important that at least two of the radicals Ri to Rj and Ri to R in formula (III) 3 represent a radical-stabilizing and / or bulky group. the term, as used in the context of the present invention Here, "bulky group" that this is a group whose dimension in the greater each in the present reaction under radical conditions or equal to the dimension of an isopropyl residue is. The term used in the invention "radical stabilizing group" refers to groups of the type defined in claim 1, their elel ttonenstrulctur stabilization of radicals possible. In detail, the following groups of the above type are: branched chain alkyl groups having three or more carbon atoms, in particular isopropyl and tert-butyl; Cycloalkyl groups, for example unsubstituted or substituted Cyclophentyl or cyclohexyl; Alcohol groups, for example residues of branched alcohols, such as isopropyloxy tert-butyloxy; aralkyl; substituted or unsubstituted aromatic or heterocyclic hydrocarbons, such as phenyl, pyridyl; Halogen; cyano; nitro; Estergruppen the structure -C (O) OR 5, wherein R 5 may be, for example, a linear or branched optionally substituted alkyl, aralkyl or aromatic group. Compounds of formula (I) are more preferably used which have, as radical stabilizing groups, the following combinations of groups: at least one substituted or unsubstituted phenyl, and C (O) R 5; at least one substituted or unsubstituted phenyl and CN; at least one substituted or unsubstituted phenyl, and C (O) OR 5; are independently at least two substituted or unsubstituted phenyl; are independently at least two C (O) OR 5; and independently at least two CN. Dialkoxycarbonyl-2-ethyl ethylene; 1.1 -Dialkoxycarbonyl-2,2-dimethylethylene 1, 1 -Dialkoxycarbonyl-2-phenylethylene; 1, 1 -Dialkoxycarbonylmethyl- ethylene; 9-Methylenxanthen; 9-Methylenthioxanthen, 9-methylene-10-H acridine or mixtures of two or more thereof, are used. The radical formation can be carried out according to the invention by different methods. Thus, a thermal, photo-chemical, electro-chemical or electron transfer induced production is possible as well as the use of oxidizing or reducing agents for radical generation. In addition, the method described herein in the presence of at least one free-radical initiator can be carried out. Furthermore, thermally, electrochemically or photo-chemically are initiating monomers can be used as initiators. In general, however, all azo conventionally used and / or peroxo compounds, and or compounds having homolytically cleavable C-C bonds can be used in the radical polymerization. Suitable initiators are, for example, in WO 98/01478 on page 10, line 17 to page 11, line 15 described, which is incorporated in the context of the present application in this respect fully, can also 3,4-dimethyl-3, be used 4-diphenylhexane and 2,3-dimethyl-2,3-diphenyl-butane. Preferably, initiators are used which are soluble in the reaction system used in each case. In reaction in aqueous phase preferably be oxidizing radical initiators, such as potassium, sodium and ammonium, or a combination of a conventional, ie, a non-oxidizing initiator with H 2 O 2. Furthermore, dicumyl peroxide, dibenzoyl peroxide, dilauryl peroxide, AIBN may be used. In a preferred embodiment of this method, a comparatively large amount of free radical initiator is added, the proportion of free radical initiator in the reaction mixture is preferably 0.1 to 50 wt .-%, more preferably 0.5 to 20 wt .-%, each based on the total amount of the monomer (a) and of the initiator. 1 to 1: the molar ratio is preferably initiator to compound (I) 3: 1 to 1: 3, more preferably 2: 1 to 1: 2, and especially 1.5 to 1.5. If the reaction according to step (i) described carried out in aqueous phase, "aqueous phase", the term to mean a phase in the context of the present text, which contains 10 to 100 wt .-% of water. If the water content of the aqueous phase at less than 10%, it is preferred in the present invention, when the aqueous phase contains a mixture of water and one or more water-miscible solvents such as THF, methanol, ethanol, propanol, butanol, acetone, methyl ethyl ketone or the like . However, it is also possible that reaction of step (i) in the presence of a mixture of water and a water immiscible solvent such as an aromatic solvent, for example toluene, to perform. In a further embodiment, the above reaction according to stage (i) in the presence of a base is carried out at least. Here, in principle, to use as low-molecular bases all low molecular weight bases, NaOH, KOH, ammonia, diethanolamine, triethanolamine, mono-, di-, or triethylamine, Dimethylethanolarnin, or a mixture of two or more thereof are preferable, and ammonia and di- and triethanolamine are particularly preferred. However, it is also possible, the reaction according to stage (i) in an organic solvent or solvent-free ( "neat"), for example in the melt, durclj-out. When solvent-free in the context of the present invention from a reaction in an organic solvent or is spoken, so including a reaction is understood, which proceeds in the presence of less than 10 wt .-%, preferably less than 5 wt .-% or less than 1 wt .-% water. in a further embodiment of the present invention is in the Bmdemittelzusammensetzung invention, at least used a block copolymer which is prepared by step (i) in an organic solvent or solvent-free has been carried out, wherein the water content of the reaction mixture less than 0.5 wt .-%, for example, was less than 0.3 wt .-% or less than 0.1 wt .-%. In a further embodiment of the present invention is ReaMonsftihrung the step performed anhydrous (i), that is, having a water content of less than 0.001 wt .-%. Such water contents can be, for example, by the use of commercially available solvents such as are conventionally used in radical polymerization as organic solvents reach. As a solvent in principle any polar and non-polar organic solvent in which the corresponding and preferably also the resulting polymers, where appropriate, at elevated temperature, are soluble are suitable in the present invention. Suitable solvents are, for example C 3 to Cio alkanes, cyclohexane, decalin, acetone, Methyletiiylketon. Diisobutyl ketone, tetrahydrofuran, dioxane, benzene, toluene, glycols such as ethylene glycol, triethylene glycol, partially or fully end-capped glycol ethers such as ethylene glycol monomethyl ether, ethyl acetate, methanol or ethanol or the higher homologs of the alkanols having up to 18 carbon atoms (optionally as a co-solvent), or mixtures of two or more thereof. The reaction according to step (i) is generally carried out at temperatures above room temperature and below the decomposition temperature of the monomers, wherein preferably a temperature range of 50 to 150 ° C, more preferably 70 to 120 ° C and in particular 80 to 110 ° C is selected. The reaction according to step (i) is generally conducted at pressures of 1 to 300 bar, made, for example from about 1.5 to 100, or about 2 to about 20 bar. Although related, the molecular weight distribution there are no restrictions in the reaction, a reaction product can be obtained according to (i) having a molecular weight distribution M w / M n measured by gel permeation chromatography using polystyrene as a standard of <4, preferably <3, more preferably < 2, in particular <1.5, and in certain cases even <1.3 has. The molecular weights of the reaction product (A) by selecting the ratio of monomers (a) to give compounds (I) can be controlled to free-radical initiator in wide limits ^ in particular, determined in this case the content of compound (I), the molecular weight, in such a way that the larger the proportion of compound (I), the lower the molecular weight obtained. The reaction of step (i) may be carried out in the presence of a surfactant. The reaction product in the reaction according to (i) can be further processed directly there, or as a macroinitiator for further reaction in step (ii), as further defined hereinbelow, are used. Further, it is possible to isolate the reaction product of step (i) as a solid and then further react. In this case, according to step (ii) at least one freely selectable, free radical homopolymerization or copolymerizable monomer (b) can be reacted in the reaction, wherein as monomers (b) are suitable which are contemplated in the description of the monomers (a) mentioned monomers. In this case, monomer (b) equal to or different from the used in the step (i) monomer (a). Of course, mixtures of two or more monomers can be used as monomer (a) and monomer (b) be used. The selection of the monomer (b) is carried out in principle for the desired Stniktur in step (ii) the polymer produced and thus depending on the intended use of this polymer. Hydroxyethyl methacrylate, acrylic acid, methacrylic acid, maleic anhydride, styrene or vinyl acetate. The reaction of step (ii) is carried out in principle according to the usual conditions of a free-radical polymerization, where suitable solvents may be present. Moreover, step (ii) is carried out usually under conditions such as those already for step (i) described above. Optionally, compounds of the formula I or II for carrying out step (ii) can be added again. The steps (i) and (ii) can in the context of the herein-described method, both spatially and temporally separated from each other are carried out, in which case, of course, first step (i) followed by step (ii) is carried out. However, the steps (i) and (ii) can be carried out in a reactor in succession Moreover, ie first the compound of formula (I) is reacted with at least one monomer (a) fully or partially, depending on the desired use or the desired properties, implemented and then added at least one monomer (b) and radical polymerization or a monomer mixture comprising at least one monomer from the beginning (a) and at least one monomer (b) used and with the compound (I) are reacted. It is assumed that the compound (I) first with the at least one monomer (a) is reacted and then the reaction product formed therefrom (A) above a certain molecular weight also reacts with the monomers (b). In this regard, in particular, be noted that the novel (co) decomposes again after a possible interruption without re-addition of initiator, by heating to a temperature at which the macroinitiator according to reaction product formed after the first stage (i), can be continued. The after the first stage (i) resulting polymers can be isolated or in situ to initiate the (further) polymerization in stage (ii) re-heated. In this case, another monomer (b) can be added directly. In this case, the monomer (b) equal to or different from the monomers (a) to be. May also be used from the start monomer mixtures. Here, the step (ii) may be repeated as often as desired. Depending Realrtionsfuhrung the invention it is possible in accordance with terminally functionalized polymers, segmented polymers, block or multiblock and gradient (co) polymers, star (co) polymers, graft copolymers, and branched and produce hyperbranched (co) polymers. As is apparent from the above, the present invention also relates to the use of the Coplymeren described within the scope of the present invention can be prepared by the process defined above, for the production of washing-active preparations. Poly (acrylic acid-b-styrene), poly (methyl methacrylate-b-styrene), poly (styrene-b-vinyl acetate), poly (methacrylic acid-b-hydroxyethyl acrylate), poly (methyl methacrylate-bN-vinylpyrrolidone), poly (methyl methacrylate Bn-vinyl formamide), poly (methacιylsäure-methylester-b-hydroxyethyl acrylate). Poly (styrene-b-vinyl pyrrolidone) and poly (styrene-stat-acrylonitrile-vinylpyrrolidone). In the above block copolymers, the distribution of the blocks with regard to length and joined at the block assembly monomers should be selected so that the resultant block copolymers are water-soluble or water-dispersible. The block copolymer A described herein may be used in amounts of 0.01 to 50 wt .-% in pulverfbrmigen detergents. Their share in powdered laundry detergents is usually from 0.05 to about 25 or about 0.1 to about 15 wt .-%. The detergent-active preparations of the invention in a preferred Ausfulirungsform up to 49.99 wt .-% additives. Besides the polymers mentioned, the inventive compositions contain anionic and / or nonionic surfactants and detergency enhancing or alkaline earth metal ions binding builders. Suitable further ingredients are washing alkalis, neutral salts, bleaches, vergrauungsverhütende agents, optical brighteners, enzymes and stabilizers as well as further, usually used in detergents auxiliaries and additives. Suitable anionic detersive substances are those particular n of the sulfonate or sulfate type, for example, alkyl benzene sulfonates, dodecylbenzene, further olefin sulfonates, α-sulfo fatty acid esters, primary and secondary alkyl sulfates and sulfates of ethoxylated or propoxylated higher molecular weight alcohols. Sodium soaps of coconut, palm kernel or tallow. The anionic detergent raw materials may be in the form of sodium, potassium and ammonium salts as well as salts of organic bases such as mono-, di- or triethanolamine. Provided that the anionic and zwitterionic compounds mentioned have an aliphatic hydrocarbon residue, this should be preferably straight-chain and have from 8 to 22 carbon atoms. In the compounds with an araliphatic hydrocarbon radical which preferably unbranched Aklkylketten contain an average of 6 to 15 carbon atoms. Hydrocarbon radical contained. Particularly suitable are polyglycol ether derivatives, in which the number of ethylene glycol ether groups is from 5 to 15 and the hydrocarbon residues are derived from straight-chain, primary alcohols having 12 to 18 carbon atoms or of alkyl phenols having a straight-chain, from 6 to 14 carbon atoms having alkyl chain. Ethylene diamino polypropylene glycol and alkyl polypropylene glycol having 1 to 10 carbon atoms in the alkyl chain. The abovementioned compounds customarily per propylene glycol unit 1 to 5 ethylene glycol units. Nonionic compounds of the type of the amine oxides and sulfoxides, which may be ethoxylated, if appropriate also be used. There may be included also zwitterionic Waschaktivsbustanzen such as alkylbetaines and alkylsulfobetaines, for example, the 3- (N, N-dimethyl-N- alkylanιmonium) -propane-l-sulfonate and 3- (TSr, N-dimethyl-N-alkylammonium) -2 - hydroxy-propane sulfonate 1. As builders, phosphates may be used, such as pentasodium triphosphate and mixtures thereof with its hydrolysis products, ie Natriumpyro- and orthophosphates or the particularly suitable for making liquid detergent acidic and neutral Kaliumpyrophosphaten. Aminopolycarboxylic acids are poly (N-succinic acid) -ethyleneimine, poly (N- tricarballylic) -ethyleneimine and poly (N-butane-2,3,4-tricarboxylic acid) - ethylenimine, which are obtainable analogously to the N-acetic acid derivatives. Further complexing acting polyphosphonic acid salts can be present, for example the alkali metal salts of aminopolyphosphonic acids, in particular aminotri (methylenephosphonic acid), 1-hydroxyethane 1, 1 bisphosphonic acid, methylenediphosphonic acid, ethylenediphosphonic acid and salts of the higher homologues of the above Polyphophonsäuren. Mixtures of vorgeannten complexing agents are used. Polyitaconic acid, Polymesaconsäure, polybutenetricarboxylic acid and copolymers of the corresponding monomeric carboxylic acids with one another or with ethylenically unsaturated compounds such as ethylene, propylene, isobutylene, vinyl methyl ether or furan. And water-insoluble complexing agents can be used. These include phosphorylated cellulose and graft polymers of acrylic acid or methacrylic acid to Cellulsoe which may be present as a woven fabric or non-woven fabrics. Further, spatially cross-linked and water-insolubilized characterized copolymers of acrylic, methacrylic, crotonic acid and maleic acid and other polymerizable polycarboxylic acids, optionally having other ethylenically unsaturated compounds in the form of the sodium or potassium salts as sequestering agents. These insoluble copolymers may be less dense foams with open cell structure as fleeces, sponges or in the form of finely ground. Water-insoluble builders are also suitable Aikalialuminiumsilikate and Alkaliborsilikate, optionally containing bound water and having a calcium binding capacity of at least 50 mg CaO / g active substance. For this purpose, include in particular compounds of formula (Na 2 O) x Al 2 O 3 (SiO 2) wherein x is a number from 0.7 to 1.5 and y is a number of 1.3 to 4.. Mixtures of the abovementioned water-soluble and water insoluble builders are useful. As washing alkalis, the carbonates, bicarbonates, borates and silicates of sodium and potassium, especially sodium carbonate and sodium silicates are at a ratio of Na 2 O: SiO 2 of 1: 1 to 1: 3.5. As bleaching agents acting oxygen are releasing bleaching agents such as alkali metal perborates percarbonates, -perpyrophosphate and persilicates and urea perhydrate in question. Sodium perborate is preferably used in anhydrous form or tetrahydrate. For the purpose of stabilization of peroxy compounds, the agent magnesium silicate may include, for example, in amounts of from 3 to 20 wt .-%, based on the amount of perborate. applicable for textile washing at temperatures below 70 ° C means, so-called cold detergent may contain bleach activators from the class of N- or O-acyl compounds which react with hydrogen peroxide in aqueous solution to form peracids. Preferred bleach activators are the tetraacetyl that tetraacetylethylenediamine and tetraacetyl. The group consisting of the bleach activator or from the per-compound powder particles can be coated with shell-forming substances such as water soluble polymers or fatty acids, in order to avoid interaction between the per compound and the activator during storage. Instead of the bleaching compounds and mixtures thereof with bleach activators and active chlorine-containing bleaching agents, for example Nafriumhypochlorit, Littaiimhypochlorit, Na or K-dichloroisocyanurate or trichloroisocyanuric acid or mixtures of alkali metal persulfates and alkali metal chlorides, which react with the application form of hypochlorite, with the inventive detergents may be combined become. This combining can be carried out already during the production of the detergent or immediately before or during application. To avoid losses, the active chlorine compounds can also enveloped with inorganic or organic coating substances or be granulated. The detergents may further contain optical brighteners, in particular, derivatives of diaminostilbenedisulfonic acid or alkali metal salts. Suitable examples are salts of 4,4-bis (-2 "-anilino-4" -morpholino-l, 3,5-triazinyl-6 "-amino) - stilbene-2,2'-disulfonic acid or compounds of similar structure, . (- - p-sulfonamidophenyl) -3- (p-chlorρhenyl) -Δ 2 carrying a Diäthanolaminogruppe, a methylamino group or a ß-Memoxyethylaminogruppe instead of the morpholino Furthermore, such type of diarylpyrazolines in question, for example 1 are used as whitening agents for polyamide fibers pyrazoline and compounds of similar structure, which carry a carboxymethyl or acetylamino group instead of the sulfonamido group. substituted aminocoumarins, for example the 4-methyl-7-dimethylamino or 4- methyl also suitable are the 7-ylaminocumarin. Furthermore, as the Polyamidauflieller compounds 1 - (2-benzimidazolyl) -2- (l-hydroxy-ethyl-2-benzimidazolyl) - ethylene and l-ethyl-3-phenyl-7-diethylamino-carbostyril useful as brighteners for polyester and polyamide fibers are the compounds. 2,5-di- (2-benzoxazolyl) -thio phen, 2- (2-benzoxazolyl) -naphtho- [3,4-n] thiophene and 1,2-di- (5-methyl-2-benzoxazolyl) ethylene suitable. Brighteners estate of the type substituted Diphenylstyrile. Mixtures of the brighteners can be used. Graying inhibitors, in particular carboxymethylcellulose, methylcellulose, further water-soluble polyesters and polyamides of polycarboxylic acids and glycols or diamines, the free, capable of salt formation Carboxylgrappen, betaine or Sulfobetaingruppen suitable include as well as colloidally water soluble polymers or copolymers of vinyl alcohol, vinyl pyrrolidone, acrylamide and acrylonitrile. The agents may further contain enzymes from the class of proteases, lipases and amylases and mixtures thereof. are particularly suitable from bacterial strains or fungi such as Bacillus subtilis, Bacillus licheniformis and Streptomyces griseus Enzymatic active substances obtained. Further constituents are neutral salts, particularly sodium sulfate, as well as biocides, such as halogenated diphenyl methanes, salicylanides, carbanilides and phenols into consideration. Liquid compositions can also contain hydrotropes and solvents, such as alkali metal salts of benzene, toluene or xylene sulfonic acid, urea, glycerol, polyglycerol, di- or triglycol, polyethylene glycol, ethanol, i-propanol, and ether alcohols. If desired, from known foam inhibitors, such as saturated fatty acids and their alkali soaps having 20 to 24 carbon atoms, trialkylmelamines, hydrocarbons and silicones, be present. Substances 0 - 1%, optical brighteners, dyes and fragrances, as well as antimicrobial agents 0 - 3%, preferably 0.2 to 2% of foam inhibitors. Also subject of the present invention is the use of a block copolymer A having a molecular weight of more than 1000, which is by means of a method as described above comprising the steps (i) and (ii) to produce, for the production of washing-active preparations. 100 g N-vinylpyrrolidone, 0.8 g of 1,1-diphenylethene, and 0.49 g of azodiisobutyronitrile 6 h at 85 ° C heated. Subsequently, 5 g of styrene are added and the mixture without stirring for a further 6 h at 110 ° C heated. This gives a solid, water-soluble substance. According to the invention was prepared according to Example 1, the poly (N-vinylpyrrolidone-b-styrene) is used as a dye transfer inhibitor. The efficacy of the present invention produced polymers with respect to the dye transfer inhibition were determined by washing tests in which the dye of the fleet was added in dissolved form. 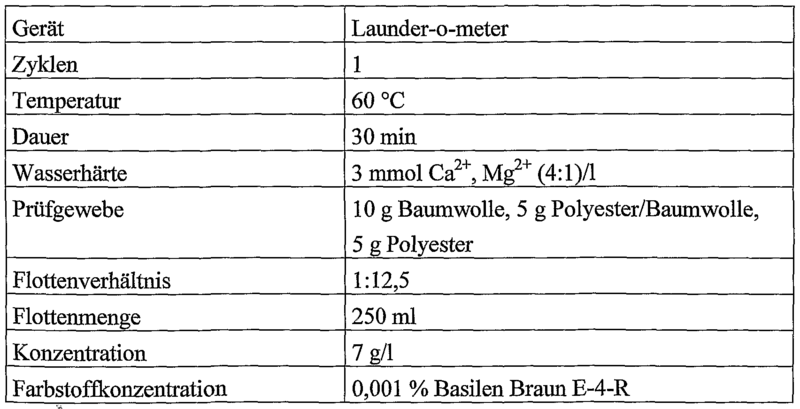 As the dye Basilen was brown E-4-R (CJ Reactive Brown 32) and used as liquid detergent Persil Color, the 1% each, based on the amount of detergent, one of the polymers listed in Table 2 was added. The washing conditions are Farbstoffüberhagungsinhibierung are summarized. As is apparent from Table 2, the addition of 1% of the inventive polymers to be used to prevent dye transfer very pronounced on cotton and polyester / cotton. Moreover, the polymer at the same concentration has a stronger effect than farbübertragungsinhibierend farbübertragvmgsinbibierende commonly known polymers. Molecular weight of less than 1,000. 2. Detergent-active preparation according spoke 1, characterized in that it contains up to 49,99 wt .-% additives. 3. Detergent-active composition according to claim 1 or 2, characterized in that, as additives, builder substances (builders) are included. 4. wash-active composition according to one of claims 1 to 3, characterized in that it contains, as surfactants, anionic and nonionic surfactants. 5. Detergent-active composition according to one of claims 1 to 4, characterized in that the block copolymer A has 2 to 6 blocks. 6. wash-active composition according to one of claims 1 to 5, characterized in that at least one block in the block copolymer A has a Polyvmylpyrrolidon structure. MXPA02012192A MXPA02012192A (en) 2000-06-16 2001-06-11 Washing active preparation.